They're back! Pokemon are set to blaze their way onto your GameBoy's once again with another wonderful adventure! I have always been a fan of the classical Disney and Warner Brother cartoons and have to admit to being a skeptic of these new age futuristic cartoons. This game however surprised me with its initiative game style and fluent animation. As a result I suddenly found myself amazingly immersed in the world of Pokēmon. For those of you like me who have no understanding of the Pokēmon storyline, it goes a little like this: In the world, where the story is set, live creatures called Pokēmon. Humans and these Pokēmon live and work together in harmony. However, there are still many mysteries surrounding them and many humans have dedicated their life to researching them. Your aim throughout the game is to obtain as much information on the different kinds of Pokēmon in your Pokēdex as possible and to also defeat Trainers, those who collect Pokēmon too, and become the best trainer. 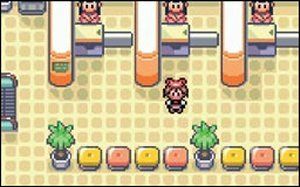 Your adventure begins in a region called Hoenn, in a little town called �Littleroot�. From there you must go about collecting Pokēmon and building up their experience points, so that you will be competitive against other trainers. Professor Birch is one of the researchers who have dedicated his life to the Pokēmon and you must constantly visit him for advice and hints. The interface of the game is innovative and easily adaptable after a few minutes of play. 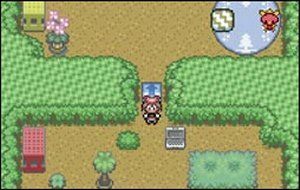 The character moves around the land using the control pad and interacts with Pokēmon and other characters through the A button. The A button also selects a command such as attack, while B cancels the attack. The fight scenes between your Pokēmon and wild Pokēmon or other trainers are well done. The interface during these scenes is also shows a lot of initiative on the behalf of the developers. Although, it may appear slightly complex at the beginning in jumping through tactics, it becomes very suitable after little time. The fight scenes are conducted in a Role Play format, which makes it quick and understandable to pick up. The interaction of the characters throughout the game is clever, with all the characters having something different to say. In most cases I found the characters to hint towards what had to be completed next. This made it much easier to get on with the game and cut out the useless searching times. There are over 200 different kinds of Pokēmon to be found and collected. The game also offers 2 on 2 battles, which is where two of your Pokēmon can fight at once against another trainer, the inclusion of Pokēmon Contests where you can groom your Pokēmon to be the best of the show and the ability to connect up with four friends for intense multi-player battles. The game allows you to nickname your Pokēmon, which I found quite a novel idea and it led to me becoming quite attached to my Pokēmon. As your Pokēmon develop and there experience points grow, they learn new moves and evolve into a bigger Pokēmon. 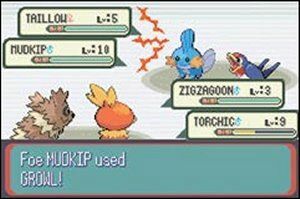 One criticism I do have was that I found it rather easy to win most of my battles with wild Pokēmon and other trainers. This may impact slightly on the long-term value of the game, yet there are so many options that make this game worthy of hours of play. The graphics and animation in the game are of the best I have seen. While not being 3D the colours and character designs make this game a pleasure on the eye. Small things such as reflections in the water and imprinted footprints on the sandy beaches make this game all the more enjoyable to look at. The animation was going to be of obvious quality from as early on as the intro. The fight scenes where the opponent speeds across the screen and where the Pokēmon use powerups and attacks are all done seamlessly. The musical soundtrack matches the quality of the rest of the game and includes the option of stereo and mono sound. The speed and style of the music change whenever anything occurs in the game that will shape the storyline or at the start of a battle scene. 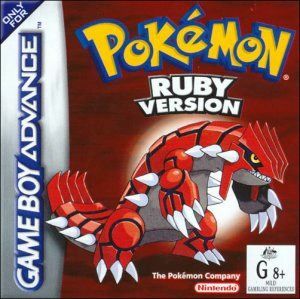 Pokēmon Ruby and Sapphire versions with their vast environments and huge numbers of characters make it an elite game on the Game Boy Advance system and a must for those with an interest in Pokēmon and a valuable one for those with little interest.